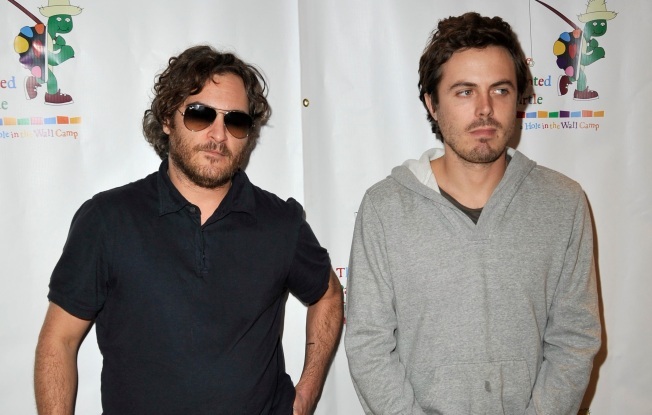 Are Joaquin Phoenix and Casey Affleck partners in crime? It seems everyone has been wondering 'What happened to Joaquin Phoenix?' Quitting acting, the bad beard, the worse rap act. Had he lost his mind? Apparently not. Two sources close to Phoenix have told Entertainment Weekly that the actor says it's all a big joke. The whole thing is a ruse, they say, and Phoenix told them so himself. His Tony Clifton moment last week, when he fell off the stage during his rapping debut, was dutifully recorded by pal, and apparent co-conspirator, Casey Affleck. So the pompous mid-career transition is a parody of pompous mid-career transitions, and Affleck is filming it for a mockumentary, not a documentary. It's a thin line, people. And one of the keys to pulling off this sort of BS-artist prank is NOT telling people you are pulling off a BS-artist prank. Well at any rate, Phoenix now joins a the pantheon of Andy Kaufman and Bruce Willis (anyone remember the Return of Bruno? ).